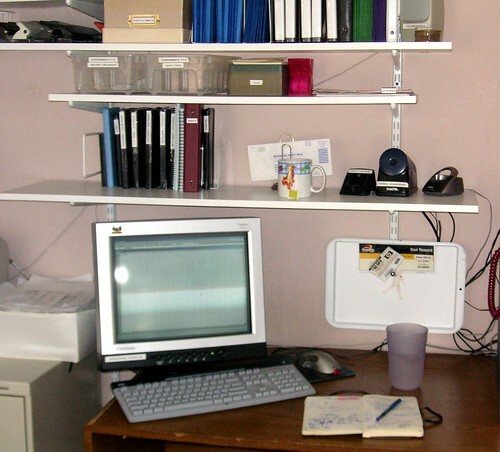 I have benefited from leaving two spots clear on the shelf above my desk. This spot is dedicated for putting the usual plain printer paper when I need to run labels, business cards, or colored papers through the printers. (The printers are just to the left of this picture.) This keeps the paper from being wrinkled or finding its way into a pile of paperwork. I find that the dedicated space for this has freed up at least twenty minutes a week, where previously I would twirl in circles, holding a sheath of blank paper, looking for just such a safe spot. I'm not proud of it; but I often eat and drink at my desk. This section of the shelf is reserved for empty dishes. My desk is in my bedroom, and the kitchen is on a different floor. This allows me to put the dishes off the desk to keep the desk clear. I clear this shelf whenever I leave the room. These two blank areas are worth the prime real estate they occupy.